I’m a student director for Student Orientation Programs. 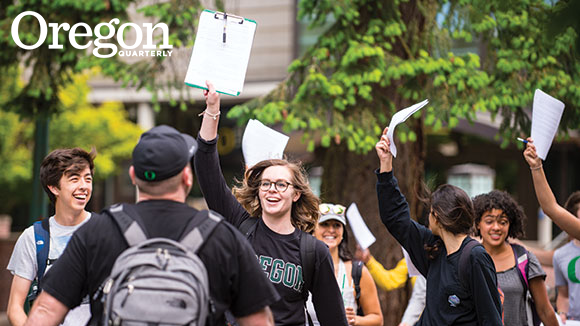 The University of Oregon’s mandatory one- and two-day orientation, commonly known as IntroDUCKtion, is our main event. To sum it up in a snap, I help create a safe, happy, and utterly exciting transition for 4,500 incoming students to the UO. I’m currently a junior studying journalism, and I’m in love with learning. I am an information junkie, a grammar nerd, and a vocabulary collector—but I find myself rushing to get back into the office the second my classes are done, just so I can do more for the program I have fallen in love with. Student Orientation Programs employs a small, tight-knit, exuberant team to plan, manage, and execute IntroDUCKtion. We have four student directors who work with Keith Frazee, our assistant director, to plan IntroDUCKtion. Every year, we hire 25 incredible student orientation staffers, or SOSers. Each member of this team leads one of the “flocks”—groups of 20 incoming students—throughout their two days on campus. They get to know each student, giving them information they need to better relate to the new community they’ll become part of. The staffers assist incoming freshmen in registering for classes, help them navigate points across campus, and accompany them to dinner at Carson. They ease the students’ fears, offer suggestions, and reassure nervous parents that the UO has great systems in place to make their child’s transition to a new home an easy one. Why do I like my job so much? It’s because of the students. I help shape their beginning-of-college experience. When I sense that I, my staff, or the program I helped create make even a tiny shift in a person’s life, an overwhelming sense of happiness comes across me. I get to see someone’s life improve, right before my eyes. While becoming a student director was never in my 10-year plan, it has allowed me to blossom into the person I am today, given me insights and skills I’ll use tomorrow, and constantly brings me more joy than I could possibly imagine. The best part of my job is when fall term comes around. I’ll be walking to class one morning, barely through my first cup of coffee, and I’ll see a student I helped over the summer holding an armful of books and chatting away with friends. They probably have no clue who I am, and barely recall their InroDUCKtion session. But I can see they they’re thriving as a student. And I love it. Abigail Mizera (holding the clipboard) is a junior from Chicago, Illinois studying advertising. She enjoys baking her Eugene-famous banana bread on a weekly basis.